Before there were the likes of Magnus Carlsen and Garry Kasparov, the late Robert James “Bobby” Fischer once rocked the world in the game of chess from the 60s to 90s and is still regarded as the greatest chess player of all time by many experts and fans. However, his apparent mental health and stubborn attitude caused the downfall of both his career and life. 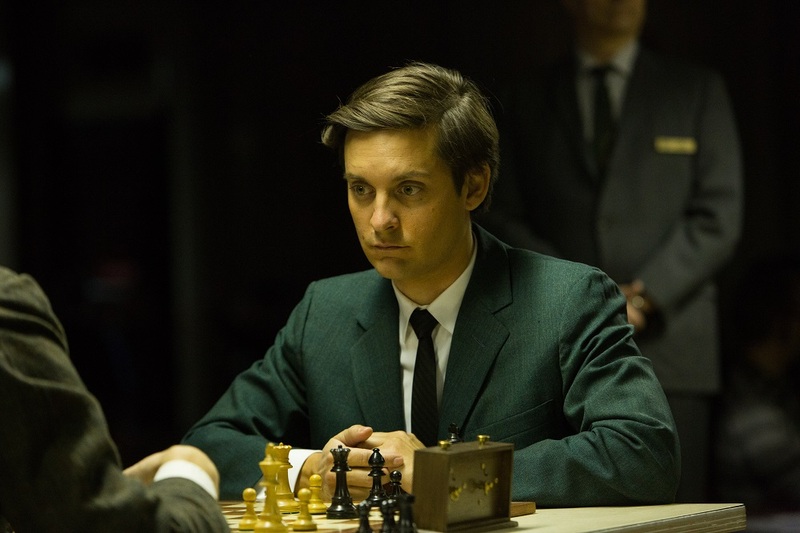 Pawn Sacrifice focuses mostly on his early life and the historical rivalry against the USSR’s Boris Spassky during the Cold War from the 60s to 70s. Although it’s based on true story with likely dramatisations, the story may seem highly familiar — a troubled genius whose work is as important if not more than his own reasons and ends up developing health problems. Titles that came to mind were A Beautiful Mind (2001) and A Theory of Everything (2014), which many would easily regard that these were far more superior films. 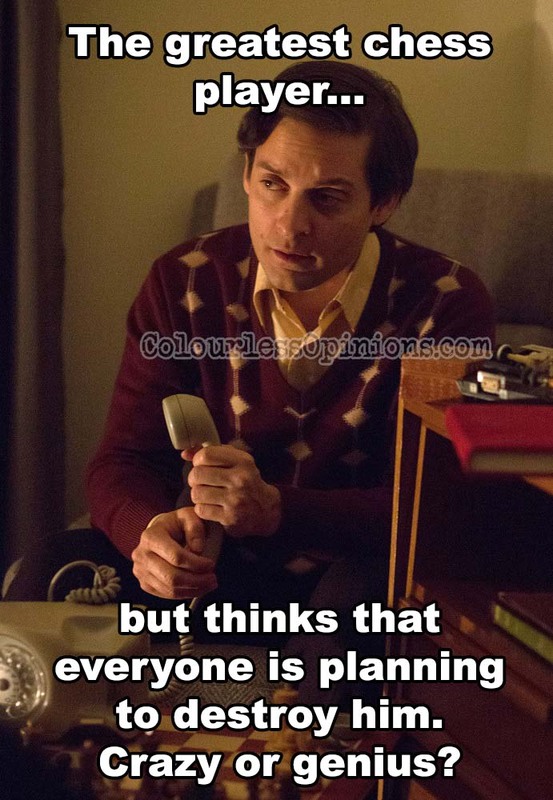 But nevertheless, Pawn Sacrifice holds its own as a strong character-driven drama with elements of thriller and comedy, and most credits go to the former Amazing Spider-Man, Tobey Maguire, who portrays Bobby Fischer like he was in the alien symbiote in Spider-Man 3 (2007) on steroids with explosive temper, arrogance, thrilling paranoia and a depth that’s never quite fully explored. It is uncertain how accurate (or inaccurate) the film is but it seems to blame Fischer’s mother, Regina (Robin Weigert), and the war for triggering his genius mind to become utterly paranoid and sensitive to practically anything. The sadness and frustration of Fischer’s condition, along with the portrayed arrogance and charm, are the main source of entertainment. At times you’d feel like giving him a slap for taking everything for granted without ever being considerate to those who’re trying their best to help him, but at the same time, you’d also fear that his own doings and psychological issues would cause him the victory in the World Championship that he dedicated his life for. 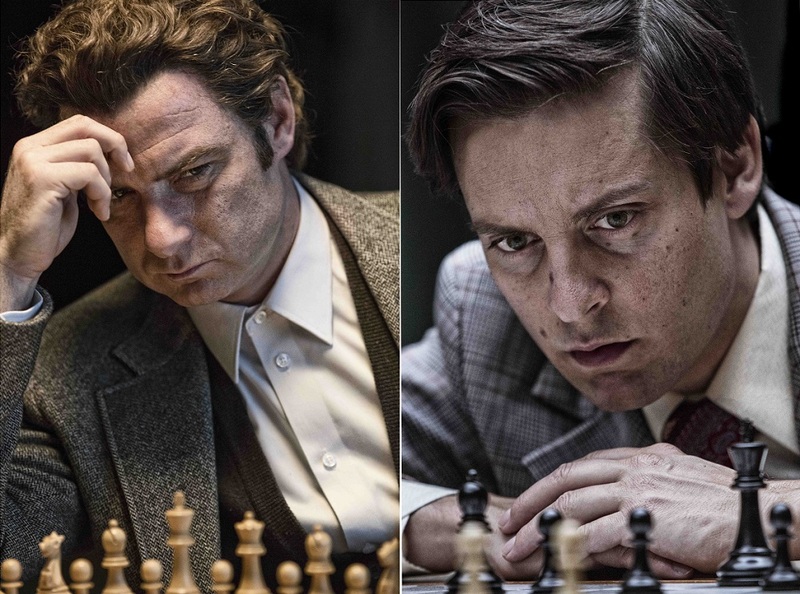 Like typical American films, the protagonist is portrayed to be a small underdog while the antagonist is a huge intimidating Russian, when in fact Fischer was much taller than Boris Spassky in real life. Spassky is played by Liev Schreiber, who was also in a superhero franchise as Sabretooth in the X-Men films. From the direction of Oscar-winning producer-director Edward Zwick (Love & Other Drugs, The Last Samurai) and the script written by Steven Knight (Seventh Son, Locke), the narrative and character development are far from even. Besides just being the ultimate rival, Schreiber gets a few more scenes to show that Spassky’s not a bad person, however not enough for the audience to truly know who this person was, unlike great films like Rush (2013) that offers both sides of the story between two champions. Fischer’s loyal assistants William Lombardy (Peter Sarsgaard) and Paul Marshall (Michael Stuhlbarg), too, are vague characters who’d stick by Fischer regardless of how he is. But what are their story? Why did Lombardy retire and become a cool priest who drinks and smokes? Why is Marshall so patriotic that he’d give in to all of Fischer’s unreasonable demands? The film isn’t so much about the passion for the game of chess. It doesn’t even clearly show what moves the characters make on the board. It is mostly done so verbally. The audience would either just know it or don’t at all, like myself. I’ve still no idea what “Sicilian” or any style of play mentioned are, nor do I understand how the characters win or lose. 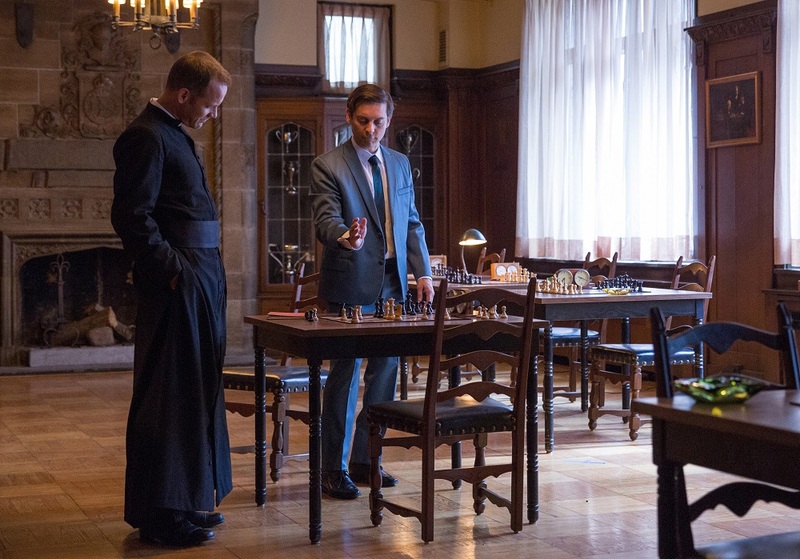 However, the chess match scenes are still very dramatically intense, through the engaging expressions of the actors along with the depiction of how this rivalry is viewed by the media and the world as the war of status between two of the most powerful countries. The film ends with a crowd-pleaser and a rather heartlessly casual brief epilogue on Fischer’s gradual demise after, which may intrigue the audience to find out more about this, as what former top chess player Garry Kasparov called Fischer’s grave, “great unfulfilled hope”. Malaysia censorship: Nothing seems to be cut at the press screening and I don’t think there’s anything that needs to be censored anyway. Second opinion: My girlfriend said that even though she knows nothing about chess nor does know how to play the game at all, she enjoyed the movie. 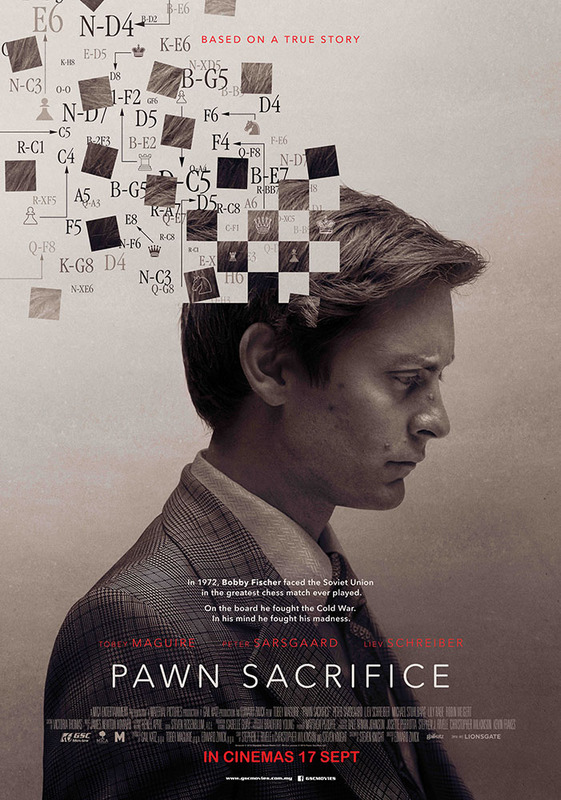 Verdict: Although it may not showcase the true genius and downfall of Bobby Fischer, Pawn Sacrifice is an entertaining film even for non-chess players. Thanks for the review. I love chess and will definitely fine some time to watch this one.